We’re always talking with our members and publishers to find out how they use NetGalley, and what is important to them when it comes to finding titles, reading them, providing Feedback. Recently some of you told us that you would like some tips on how to write a book review and what happens once you submit your review to the publisher via NetGalley. First, I’d like to start with why your reviews are important to the success of the book and the author. Since most titles on NetGalley are pre-pub and not even yet on sale, publishers are making them available for a very specific purpose: to gain feedback and insight from you–professional readers and influencers. These reviews will later help inform consumers, too. NetGalley goes to the Folio Prize! It sometimes felt like the whole of literary London was gathered in one opulent ballroom last night, as the second Folio Prize Awards ceremony was held at the St Pancras Hotel. Already this is a prize that feels like it has become an integral part of the fiction-world’s year – and the diversity and excellence of the shortlist gave the evening a touch of spice. There was genuine interest in the decision as no one could predict which way it was going to go. Jenny Offill’s The Dept of Speculation seemed to be the favourite in the room, but there was certainly no consensus – until William Fiennes, chair of judges, eventually announced Akhil Sharma as the winner of the 2015 Folio Prize for Fiction. His novel, Family Life, was a surprising winner in many ways: on the surface, perhaps the most conventional of the eight shortlisted titles; also the bookmakers’ outside bet – with Colm Toibin and Ben Lerner the front runners. Yet the award was greeted with enthusiasm by many, and Akhil Sharma’s acceptance speech – in which he thanked his editors for allowing him to be nine years late in delivering his novel – showcased his self-deprecating and touching wit. Family Life is a worthy winner of a prize devoted to excellence in fiction. It is moving, touching and subtly written – a quiet book, but one that sears into the memory. Based on the true story of Sharma’s brother’s accident and his subsequent need for round the clock care, it is a nuanced and poignant story of immigration and family, of home and otherness. NetGalley has been proud to partner with the Folio Prize throughout the whole judging process – and we couldn’t be happier with the result. We can’t wait for next year! Welcome Mandy Peterson, Media Specialist at Schuyler Community Schools in Schuyler, Nebraska, as our guest. Mandy is a long-time NetGalley member, a plugged-in librarian and has been generous enough to answer our questions about the role of technology in her library. Keep reading to discover how Mandy became a librarian, what a 1:1 school is, and what she’s reading via NetGalley! A great place to start is your librarian origin story – how did you become a school librarian? In my fifth year of teaching, I realized that the library was my favorite place to go. When my students were at lunch or in specials, I frequently could be found browsing or volunteering to reshelve books. During these visits, the librarian and I developed a nice comradery and I began bouncing ideas around for what grad program I should begin. Originally, I was thinking math or science. She suggested the library program at University of Nebraska at Omaha. The head of the Library program drove 2 hours to come visit me at my house. After that meeting with Dr. Rebecca Pasco, I was not only “sold”, but I was also confident that library was the right direction for me. I continued teaching while taking graduate courses to become a librarian. When the high school librarian in my district retired, I was fortunate enough to snag the position. We are currently taking the library from a traditional library to a 21st century library (as well as changing the role of librarian). I love working with the students, parents, teachers, staff, and community at Schuyler Community Schools! How has having access to digital galleys impacted how you recommend titles for purchase but also to your students? Through digital galleys, I know what’s coming up. As I read, I may not personally love the book but I can usually think of the student who will. So I talk to them, “Hey, I’m reading this book you might like. Here’s what it’s about…” Then I allow students to help me decide what to purchase. If they seem interested, I’m all over it. Digital galleys have also encouraged me to go outside of my personal preference zone. I am usually decidedly dystopian and sci fi young adult lit. Through NetGalley, I’ve discovered paranormal/horror, contemporary, and historical fiction that I really enjoyed. These purchases have been incredibly easy to make because I’ve seen the quality of the material. Purchasing on blind faith with tax payer money is rough. I am able to feel more secure when I’ve already previewed the material. I’ve actually recommended NetGalley books to family members, other library buddies, and community organizations. Since I also post my reviews to our blog, Twitter, Amazon, Facebook, and Goodreads, strangers are using my recommendations to decide what they should read – which is a very flattering notion! Do you have a certain strategy for finding new titles, particularly on NetGalley? I immediately head to Young Adult/Teen books. Not only is it what is mostly in the SCHS Library, but it is also what I enjoy reading personally. Don’t tell anyone but I am a bit of a total cover snob. The cover is what first attracts me. I am more apt to read the galley of an author I have never read before. Publisher summaries are a big deal. I find that a well-written summary can move a book from “meh, I’ll read it when I get time” to “I MUST READ THIS IMMEDIATELY!”. What upcoming book on NetGalley are you the most excited about sharing with your students? WOW! 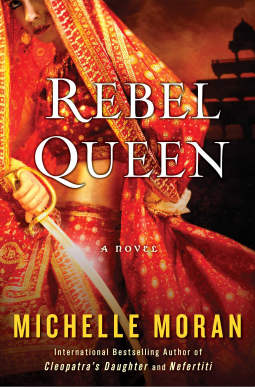 Rebel Queen by Michelle Moran hands down. I hadn’t read any of her books before and historical lit wasn’t really my interest. This book blew me away. I have my dystopian kids who are devouring the Shatter Me series (by Tahareh Mafi) and historical fiction fans reading The Walled City (by Ryan Graudin) – all are eagerly awaiting the release of Rebel Queen. The snow is finally melting, and so are our hearts… for these beautiful covers! Here are some covers we adore this month, including YOUR top-loved cover this month – DEEP by Kylie Scott! Today we have a special post to coincide with our feature on the Parenting & Families category. Introducing our new favorite thing for book-loving parents. . .
We got the scoop from our friends at Penguin Random House on their new initiative. Brightly is a new online resource to help parents raise lifelong readers and book lovers. Through thoughtful recommendations, expert tips, and fun ideas, Brightly aims to help make reading meaningful and memorable for families. Why did you start Brightly? We love books and reading. And we want our kids to love books and reading, too. But with more than a quarter of a million children’s books on the market, finding the right book for the right child at the right time can be a challenge! Parents are busy, and not everyone is blessed with a fantastic local bookstore or librarian to guide them. We want to make it a little easier, and a lot more fun, for parents to raise children who love to read. You can read more about what inspired us to launch Brightly and what we hope to offer parents in The 7 Reasons We Started Brightly. What kind of content can we expect to see on Brightly? On Brightly you’ll find book recommendations for kids of all ages from across the publishing world, as well as reading tips and insights, special author and illustrator content, personal essays, seasonal activities, contests, sweepstakes, and more. Our focus is on celebrating and embracing different kinds of readers, kids, and interests. Check out some of our recent posts on reading aloud to big kids, diverse books, questions to ask librarians, understanding the Common Core, and book recommendations for grown-ups. Brightly is a Penguin Random House initiative co-founded by Amanda Close and Christine McNamara, who are booklovers, moms, and book-publishing professionals. The site’s editorial direction is led by Liz Kotin, formerly of DisneyBaby.com. The Brightly team brings together some of the best voices covering reading and parenting on the Web to offer inspiration and guidance around creating a reading life for your family. Brightly contributors include teachers, librarians, and bloggers such as Tom Burns, Devon Corneal, Janssen Bradshaw, and Melissa Taylor. Learn more about the folks behind Brightly and our Contributors. Why is the site called Brightly? We chose the name Brightly because we believe reading has the power to illuminate kids’ lives. Reading is a window to the world for children, and is critical to a bright future in school and work. When we think of our own reading experiences as children, some of our fondest memories are reading under the covers at bedtime with a flashlight. It’s that kind of love for reading that we want to inspire. What’s the best way to experience Brightly? Checking out the Brightly website, and signing up for the newsletter are great places to start. We also have a great community on our social channels such as Facebook, Twitter, Pinterest, and Instagram. Come join the conversation! The finalists for the PEN/Faulkner Award were announced on Tuesday and we’re so pleased that many of them were available on NetGalley! We were happy to partner with PEN/Faulkner this year to provide an optional digital reading system for nominated titles. Did you read any of these books via NetGalley? Please be sure to share your feedback with the publisher and your social media followers, and congratulate these authors on their finalist status!